Fire safety is paramount in schools of all levels. Fire safety is paramount in schools of all levels. 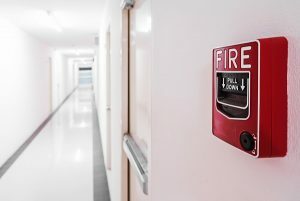 However, beyond the fire drills that are held periodically throughout the academic year, it’s likely that not much else is done to actively prevent fires or improve the amount of fire protection that is present. Here is some more information about the fire safety measures that can benefit all schools. Many of the necessary safety measures available to all schools involve common sense. One such measure pertains to the careful use of portable heaters, especially during the winter and early spring when mornings are still chilly. Anything flammable or combustible should be kept away from the heating element of the heaters. Also, all cords connected to electrical devices should be checked and rechecked on a weekly basis to ensure they are not damaged. Limiting or prohibiting the use of candles is another fire safety measure that is often overlooked even though these items can often be the source of a fire in school buildings. Emergency exit doors and their signage must be kept well-maintained as well. The interior hallways will also have doors that lead to the next corridor. Although it may ease the flow of traffic during the space between classes or meal times, propping the doors open is inadvisable. This is because an open door can allow a fire to spread more quickly than a closed door. All of the fire doors need to be tested and inspected on a regular basis to ensure that they do not malfunction in an emergency. It is important for secondary schools to follow all of the basic safety measures as outlined above. However, middle and high schools often offer additional educational programs that have students learning in other spaces that are not traditional classroom settings. Whether these settings are in the science laboratory, a kitchen space, or workshop, all care must be taken to protect students and teachers from possible fire hazards. For instance, in chemistry classes, the chemicals used in experiments need to be safely stored or disposed of to avoid any accidents. Kitchens should have properly-charged fire extinguishers in case a grease fire starts, and workshops must be also be kept free of any potentially flammable debris. In all areas, proper ventilation is also a necessity to help protect everyone inside from any fires that start. This entry was posted on Friday, February 8th, 2019 at 4:48 pm. Both comments and pings are currently closed.